​Looking for a break or some free time? Need to go to the store or appointments? Join our Mother's Day Out Program, which offers children ages 1 - Kindergarten age a semi-structured time to learn social skills while having fun and making new friends. Register for either a Monday, Tuesday, Thursday, and/or Friday. Our Mother’s Day Out (M.D.O.) program allows parents to schedule “free time” during the day. Parents drop off and pick up their children at M.D.O. from 9:30 am-1:30 pm. 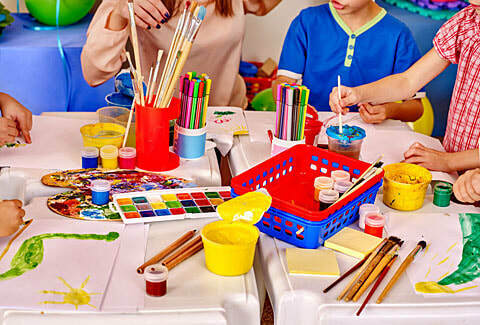 Our program emphasizes preschool play experiences, socialization skills, arts/crafts, musical and pre-academic skills in a recreational setting. Your commitment is on a month by month basis. Parents provide a sack lunch, and we provide a mid-morning snack and apple juice! Children DO NOT need to be toilet trained. The program runs from September 2018 to May 2019 and follows the District 62 School schedule. There is a one time registration fee of $25 per child for each day you reserve. This fee is non-refundable and will not apply to your first months tuition. Tuition is $20 per day per child payable at the beginning of the month. There is a discount available for children who attend 3 or 4 days a week. ​There is also a 1- day drop-off option available at $30 dollars per day when space allows.